“The UK is now facing a national crisis”, according to Margaret Thatcher’s former Defence Secretary, Michael Portillo, speaking to a dinner in London on Thursday night. Brexit continues to tear the UK apart, and places the economy at greater and greater risk. Article 50 of the Lisbon Treaty sets out the rules for leaving the European Union. As with most negotiations, it assumed the leaving country would present its proposals for the post-withdrawal period – which would then be finalised with the other members. But the UK Cabinet was split on the key issues, and so the 2 year’s notice was given on 29 March 2017 without any firm proposals being made for the future UK-EU27 relationship beyond 7 “negotiating principles and “the desire for a “close partnership”. “Brexit means Brexit“, has been the UK’s core statement since Article 50 was tabled. 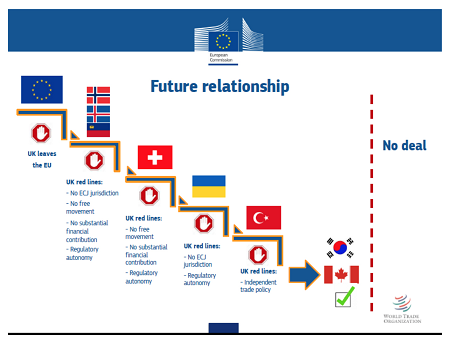 But as I noted back in September 2016, Brexit can actually mean a variety of different outcomes – and they have very different implications as the chart shows. At one extreme, the ‘Norway model’ is very similar to full EU membership, but with no say on EU decisions. Whereas the ‘Canada model’ is simply a free trade agreement offering some access to the Single Market (qv) for goods, but less access for services (which are 80% of the UK economy). A ‘No Deal Brexit’ (qv) means working under WTO rules with arbitrary tariffs and regulations. The European Commission manages the day-to-day business of the European Union (qv) on behalf of the European Council, and is effectively its civil service. Its president is Jean-Claude Juncker and he appointed Michel Barnier to lead the Brexit negotiations. Barnier’s first step, as mandated by the Council, was to agree within the EU 27 “the overall positions and principles that the EU will pursue“. He understood that in any negotiation, the team that writes the drafts and controls the timescale usually has the upper hand. The UK’s failure to finalise its own detailed objectives before tabling Article 50 meant it gave up this critical advantage. The Default date for Brexit is 29 March 2019. It has also been agreed that if a Withdrawal Agreement (qv) is finalised, then a Transition Agreement (qv) could operate until 31 December 2020. Unfortunately, many people have therefore assumed they can wait until 2020 before starting to plan for Brexit. But as the Commission warned in its ‘Guidelines for Brexit Negotiations on 29 April 2017, “nothing is agreed until everything is agreed“. So No Deal also means no Transition Agreement. The European Union is a treaty-based organisation of 28 countries. As its website notes, it was “set up with the aim of ending the frequent and bloody wars between neighbours, which culminated in the Second World War“. The UK joined the original 6 members (Belgium, France, Germany, Italy, Luxembourg and the Netherlands) in 1973, along with Ireland (qv) and Denmark. Further expansions took place, especially after the end of the Cold War between the West and Russia. At the suggestion of then UK premier Margaret Thatcher, it was agreed to establish a Single Market (qv) and Customs Union based on 4 key freedoms – free movement of goods, services, people and money – and this transformed trading relationships across the continent. The Financial Settlement or ‘divorce bill’ covers the costs of the programmes that the UK agreed to support during the period of its EU membership. Like most organisations, the EU operates on a pay-as-you-go basis and only charges member countries as and when bills actually come due. The UK calculates this to be between £36bn – £39bn (€40bn – €44bn), depending on the assumptions used. The Labour Party want a General Election if the government fails to get Parliament’s approval for its proposed Withdrawal Agreement. But there is considerable uncertainty about what might happen next, if Labour won the election. Some suggest Labour could renegotiate the deal, others that there could be a second referendum. Either option would mean a new government asking the EU to ‘stop the clock’ on Article 50. As a result, support is rising for the idea of a ‘People’s Vote’, or second referendum, as this might be more able to achieve all-party support. The European Parliament elections in May also complicate the picture as a referendum would apparently take 22 weeks to organise. A Hostile No-Deal would be the worst of all possible outcomes. But Theresa May has warned Parliament that “without a deal the position changes” on the £39bn Financial Settlement, contradicting her Chancellor, Philip Hammond. We do not know what would happen if the UK refused to pay, but one fears it could lead to a Hostile No-Deal if the EU then reacted very negatively in terms of future co-operation. Ireland has proved to be a key sticking-point in the negotiations, as nobody wants to disturb the peace created by the Good Friday Agreement in 1998. The issue is the potential need to reintroduce a border between Ireland and the North to secure the Single Market. The draft Withdrawal Agreement devotes a full section to this issue, which remains a potential deal-breaker due to Brexiter concerns about N Ireland remaining in the Single Market and the UK remaining in the Customs Union. This expert Explainer from the impartial Institute for Government highlights the key issues. June 2016 was the date of the referendum that voted to take the UK out of the EU. Keeping the UK in “a single customs territory” with the EU after Brexit is a key feature of the so-called “temporary backstop arrangement” designed to avoid a hard border with Ireland. It is intended to operate until a full free trade agreement is finalised between the UK and EU. It was the most difficult part of the negotiations, and has provoked the most resistance from Brexiters. Legal issues are, of course, a critical area in the negotiations as the UK currently operates under the jurisdiction of the European Court of Justice (ECJ), and the UK wants to “take back control” to its own courts. However, the Withdrawal Agreement confirms that the ECJ will have a continuing role under the Transition Agreement and potentially afterwards if the “backstop” is activated. Tariffs on Materials and goods would be introduced between the UK and EU27 if there is a No-Deal Brexit. Less well understood is that the UK’s trading terms would also change with countries outside the EU27, as the UK currently operates under more than 750 free trade and trade-related agreements negotiated by the EU – and it is unlikely that the UK could continue to benefit from them. No Deal means that the UK would have to operate under WTO rules after 29 March. This short Ready for Brexit video explains the complications this would create. The WTO has also warned that the number of Technical Barriers to Trade “has grown significantly” in recent years, and these can often severely restrict trading opportunities. And EU laws would still have a role under WTO rules for all UK products sold into the EU27 under No Deal. The EU Preparedness Notices, for example, also suggest there could be a ban on UK banks providing financial services as well as a whole host of other restrictions including on travel. Preparing for Brexit. My colleagues and I have set up Ready for Brexit. This is a subscription-based ‘one-stop shop’ and provides a curated Directory to the key areas associated with Brexit – Customs & Tariffs, Finance, Legal, Services & Employment, Supply Chain. It includes Brexit Checklists; a BrexSure self-audit tool to highlight key risks; a Brexit Negotiation Update section linking to all the key official UK and EU websites; Brexplainer video on WTO Rules; plus news & interviews with companies about their preparations for Brexit. Regulations can often be a much greater barrier to trade than tariffs, as they set out the rules that apply when products and services are sold in an individual country. The EU never aimed to harmonise regulations across its member countries, as that would be an impossible task. Instead it has focused on creating a Single Market via mutual recognition of each other’s standards, along with harmonised rules on cross-border areas such as safety, health and the environment. Regulations are particularly important in the financial services industry, and many businesses are now relocating relevant parts of their operations into the EU27 so they can remain authorised to trade. The Single Market seeks to guarantee the free movement of goods, services, people and money across the EU without any internal borders or other regulatory obstacles. 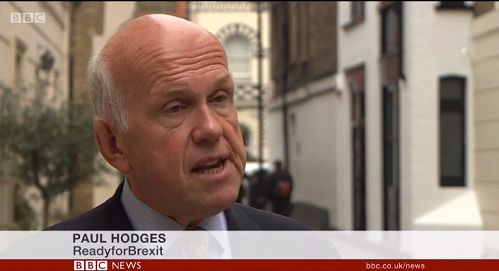 It includes a Customs Union, as this short BBC video explains, which seeks to ensure that there are no Customs checks or charges when goods move across individual country borders. With a No-Deal Brexit, however, the UK will become a Third Country and no longer benefit from these arrangements. The Transition Agreement covers the period after 29 March, and would allow the UK to operate as if it were still in the EU until 31 December 2020. The aim is to give negotiators more time to agree how future EU-UK trade in goods and services will operate, and provide guidance for businesses on how the new deal(s) will operate. But 21 months isn’t very long, as trade deals are very hard to do and generally take 5 – 7 years. The problem is that they create Winners and Losers whenever a market (large or small) is opened up to new foreign competition – and the incumbents usually complain. The Transition Agreement will only operate if there is a Withdrawal Agreement and so would not happen with a No-Deal Brexit. Unblocked, or frictionless trade, is a key aim of the negotiators. Nobody really wants to go back to the pre-1993 world, before the Single Market arrived, when vast numbers of forms had to be filled in and lorries/ships sometimes stopped for hours for border checks. 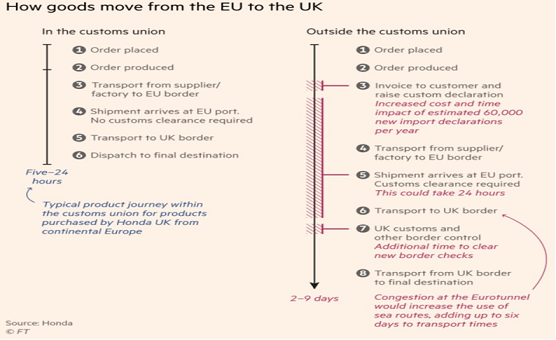 As Honda explained in the summer (see chart) it could easily take between 2 – 9 days to move goods between the EU27 and UK without a Customs Union, compared to between 5 – 24 hours today. The cost in terms of time and money would be enormous given that, as Eurotunnel told the Commons Treasury Committee in June, “Over the past 20 years, warehouses have become trucks rolling on the road“. The draft 585-page Withdrawal Agreement was published on Thursday and sets out the basis for the future UK – EU relationship after Brexit. The impartial Institute for Government has produced a expert summary of its key points. But as the resignations have shown, the deal is contentious, with observers suggesting that MPs may vote it down in Parliament next month. Zig-zag perhaps best describes the process that has led us to this point. It began long ago when Margaret Thatcher resigned in 1990, as the catalyst was her position over European monetary union. Her supporters ignored the key fact that the party needed a new leader if it was to have a chance of winning the next election, and instead blamed Europe for their loss – soon styling themselves as Eurosceptics in her honour. Fast forward through many zigs and zags and as I warned in March 2016, – “Slowly and surely, a Brexit win is becoming more likely“. We can doubtless expect many more in coming months and years. 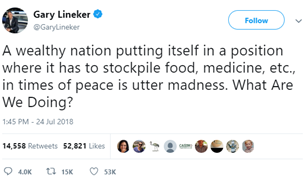 Lineker’s concern was confirmed last month by the head of the British Chambers of Commerce who warned that “precision is what is required” regarding the Brexit process, rather than “declaratory statements”. Yet today, with less than six months to go before the UK officially leaves the EU, businesses still do not know if the UK will simply crash out with no deal on 29 March, with no transition agreement in place. This is almost unbelievable, given that the EU is the UK’s largest trading partner, taking 44% (£274bn) of UK exports in 2017, and provides 53% (£341bn) of all UK imports, according to a July report from the House of Commons library. One problem is that the cabinet only finally agreed on its chosen option for the new EU relationship in August. In turn, this means the civil service is only now starting to be able to advise sector groups, trade associations and other experts on the key issues involved. A second problem is that the new Brexit department had to be created virtually overnight after the June 2016 referendum, and the average age of its staff is just 31 years. Many have no personal experience of the enormously complex issues involved. Chemical companies are, of course, right in the middle of this no-man’s-land. They depend on frictionless movements of raw materials and intermediates between their various EU sites, and they are heavily integrated into just-in-time supply chains with key customers such as the auto and food industries. The UK government has recently warned of possible major disruption if there is a No Deal Brexit, and the Key UK Risks chart highlights the key economic and business risks that lie ahead. The UK and EU will both lose from a No Deal Brexit and so in principle they could simply “fudge” the trade issue for future discussion during the transition period until December 2020. But although both sides emphasise that 80% of the withdrawal agreement is now agreed, this only highlights that the most difficult 20% still lies ahead – issues such as Ireland, immigration and EU citizen rights, and future trade relations. What happens if May does stumble at this point and fails either to gain an agreement with the EU27 or to get it safely through the Cabinet, Tory party and Parliament? As the Risks chart shows, this might well lead to financial market pressure on the pound and interest rates. This would also represent more bad news for chemical companies. If even 20 Tory Eurosceptics vote against a deal, then May would have to rely on opposition party votes, and their support looks unlikely given Labour’s “six tests” for approving any deal. Exchange rate volatility could become a critical issue for companies and investors if this scenario is reached, with the pound possibly falling towards parity with the US dollar and the euro, causing interest rates to rise. Foreign investors currently own 28% of the government’s £1.9tn debt, and concern over the value of the pound could lead some to reduce their holdings of government bonds. 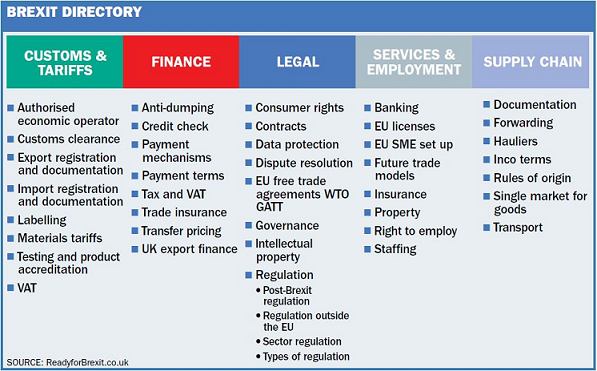 The Brexit Directory chart from Ready for Brexit shows the scale of the risks involved. It highlights how Brexit potentially involves almost every aspect of business – from Customs & Tariffs through Finance and Legal issues, to Services & Employment and the Supply Chain. Of course, many major companies have already spent months and millions of euros in preparing detailed contingency plans. Some are already stockpiling key raw materials and products, and revising relevant contract clauses. But smaller businesses do not have these resources. Surveys show that only one in seven have done any forward planning for a No Deal Brexit, and official government guidance for a No Deal has only just begun to appear. In turn, this creates a clear risk of widescale disruption, as today’s highly integrated supply chains are only as strong as their weakest link. The lack of just one raw material can stop a production line. As Gary Lineker says, it is hard to believe this is happening. But it is, and so far “declaratory statements” rather than precise detail continue to dominate the process. It is also easy to forget that a No Deal Brexit will not just impact the UK. US and EU-based businesses involved in a supply chain that involves a UK company face a clear risk of disruption. This is why I have helped to launch Ready for Brexit with other industry colleagues. As the Scout motto reminds us, to ‘Be Prepared’ could be critical for business survival if a No Deal Brexit does occur. Please click here to visit Ready for Brexit, and click here to download the full ICB analysis. The post Is your business Ready for Brexit? appeared first on Chemicals & The Economy.